This post is a bit of a mixed bag so I will start off with a couple of things not related to the Mediterranean book. I owed a favor to one of my wargaming buddies and the other had his 60th Birthday coming up, so the first couple of pictures are of some AB Miniatures and a building that they wanted me to paint for them. Next up I painted some civilians which I can hopefully use for both the Napoleonic Peninsula and WW2 Sicily/Italy. Some are obviously suited for one more than the other. For the WW2 theme with the book, I also needed to make some telegraph poles and a couple of destroyed buildings. In the book I show you two options of how I make a destroyed building, one is a commercial kit that I have added to and the other is made from scratch. I have also made a batch of damaged roofs that is a quicker and easier way of showing and giving an impression of damaged buildings and allows you to use the same building in both good and damaged condition. Hopefully, I will eventually be able to make a damaged roof for each of my buildings but these will do for now otherwise I will never get the book finished. I need to scatter rubble and broken roof tiles around the buildings for a proper picture shoot but these pictures will give you an idea. If you are new to this blog and you are interested in the first book, Setting The Scene - Winter Wargaming, then we now have extra copies in stock so just go to the top right of this page (second box down) and click on 'Setting The Scene' if you want to buy a copy. As always, masterpieces, every one. Thanks Jonathon, you are too kind. Your ruined buildings and splendid civlians create a wonderful and realistic atmosphere...Superb as always Pat!! More fantastic stuff Pat. You using corrugated boxes for the roof shingles? As to your rubble, you mentioned adding for photos. Do you glue rubble to the buildings or just sprinkle it on for a game, then collect it from the bases afterwards to allow multi-use of the buildings? Hi Terry, yes corrugated card for the roof, a step-by-step guide will be in the book. The rubble in the pictures is permanent and all been glued. I will add additional rubble for games. Nice painting for the figures. Very kind of you Stew. Great additions! The damaged roof trick is very smart. Lovely work Pat, your buildings look very realistic. Great looking photos as always! Looking forward to the book Ive started my Italian scenery but Id happily snap up another book! Haha, love the photo of the two tommies hiding from the dastardly german on the balcony! Looking impressive as always! Really like the idea of the damaged roofs. As always, Excellent stuff. I was thinking "blimey, he must have ton of Buildings" but, I´m Picture orientated and hadn´t read the bit about spare Roofs and only noticed on the pics. As usual an excellent display of what wargaming is all about! Goodness Pat, I step away from blog viewing for a month or 4 and come back to see you're darn near finished with the Med project and might I add, WOW! Truly talented mate. Thanks chaps, very much appreciated. Those ruined buildings look great. 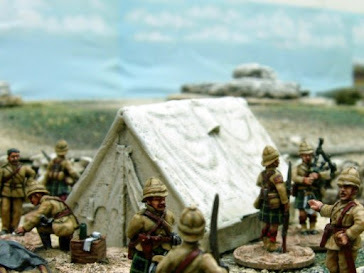 More beautiful terrain and figures - wonderful work as always Pat. You have truly a great collection now for Peninsular/Sicily/Italy. Awesome job on these houses!! Trully realistic! !